THURROCK Council has continued its crackdown on littering in the borough after eight litter bugs were forced to pay more than £4,000 between them. On Monday 4 February, a hearing at Basildon Magistrates Court saw eight people prosecuted and found guilty of littering offences in Thurrock, given a criminal record and ordered to pay a fine and costs. All eight had been previously issued a Fixed Penalty Notice (FPN) by enforcement officers. 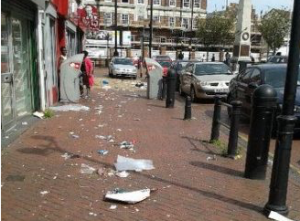 Cllr Gledhill, Leader of Thurrock Council, said: “Dropping litter in Thurrock spoils our streets, parks and town centres for those living, working in and visiting the borough. It is unacceptable to drop litter and anyone who does this can expect to receive a £150 fine for this offence.